I have owned my dog for just over a month now. 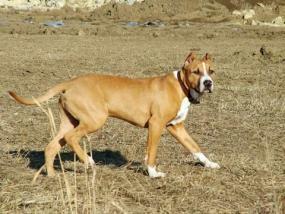 Sky is a six-year-old Staffordshire mix, and has lived outside with her birth mum until now. Unfortunately, they had to be separated and Sky has now come to live with me. Here are my current problems. First, Sky has never been house-trained, and since living with me for the first week and a half she was fine. All of a sudden she started weeing at night in the hall and kitchen. We take her out for a long run in the evenings at about 11:30 p.m. and get up at 6:30 a.m. for her morning exercise, so I don't understand why she is doing it or how to get her to stop. Second, Sky has grown very attached to me, and resists when my partner tries to take her for a walk if I'm in the house. He will take her all the way downstairs, but it doesn't matter what he does to try to get her out. She stands her ground and will not move until I join them. I have suggested to my boyfriend that when she does this, she will just have to miss out on her walk, and maybe then she'll get wise that if she does not go with him she misses out; but at the same time we don't want to be cruel. Sky has also growled at my sister when she came near. I have tried not to give her as much attention so she will go for walks with my boyfriend without me and be nice to people when I'm around, but I feel cruel doing it and was wondering if there was a way around this. It's not a huge issue at the minute, but I worry if it keeps on and I allow it, she will get a lot worse and one day maybe even bite somebody. Your instincts are correct. Sky is displaying dominant behavior over you, no matter how affectionate she seems, and you need to nip this behavior in the bud if you want harmony in your household. To begin, you must correct her with a firm "No!" whenever she growls at guests in your home. This will send the message you're in charge here, just as you should be. I'd also suggest that you enroll her in obedience classes and let your partner participate in the training. This way, she'll learn she must be subordinate to both of you and obey him too. Skipping walks will only exacerbate the house accidents. Next, I'd advise emptying her water bowl at about 10:00 p.m., and not making the 11:00 p.m. walk a long or strenuous one so she's not too thirsty when you return. This will alleviate some of the need to go overnight and allow you to get a better handle on the accidents. You don't mention where she sleeps, but I'd recommend confining her to a bathroom or laundry room overnight. She may be less likely to soil in a confined space. Once she gets the idea, you can try leaving her loose again, but be sure to thoroughly clean the area of her former accidents with white vinegar to help destroy the old urine scent, or she'll be drawn right back. I commend you for adopting a six-year-old dog. So many worthy pets go homeless just because of their age. Sky seems very devoted and grateful to you for giving her a home and family, she just hasn't had enough socialization to learn her proper role. I think you'll be able to work out her current issues and turn her into a good house companion if you give her enough time and training.